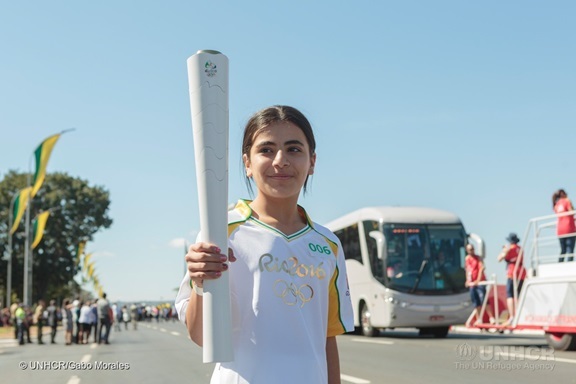 After the first day of the Rio 2016 Torch Relay, among all the Olympic athletes and other celebrity torch runners, twelve-year-old Hanan Dacka, a Syrian refugee, will among the most remembered. After beleaguered President Dilma Rousseff lit the Olympic torch for the first games ever to be held in South America, Hanan carried the flame down the Esplanade of Ministries. “By carrying the Olympic Torch, people from all over the world will know that refugees are real people, and that we can do positive things,” said Hanan. The Brazilian leg of the Olympic Torch relay started last Tuesday and will conclude on August 5th in Maracanã Stadium, where the Olympic brazier will be lit. The torch will pass through 300 towns and cities in Brazil, from the Amazon to Rio de Janeiro. Hanan’s journey began in silence. Her father, Khaled, was imprisoned and tortured for 11 months for helping friends escape the Syrian civil war. A judge released him with the quiet warning that he was marked for assassination by the government. A childhood friend serving in the Syrian army helped the Dacka family escape in two cars with Khaled in the lead car: “If they were going to kill me, I didn’t want my family to see me die,” said Khaled. Miraculously making it through 16 military checkpoints, the Dacka family reached the Za’atari refugee camp in the Jordan desert, where they remained for two and a half years. Their journey took them into the embrace of Brazil in February 2015. Since 2013, Brazilian consulates in the Middle East have been issuing the special visas under simplified procedures to allow survivors of the war to travel to Latin America’s largest country, where they can then present an asylum claim. Despite the geographical distance, Brazil recently extended the “open-door” policy for a further two years to give more people a chance to rebuild their lives after fleeing a war that has killed at least 250,000 and driven almost 5 million into exile. Today, Hanan speaks Portuguese fluently and is thriving both in school and in life. Her 11-member family plans to remain in their tiny São Paulo apartment. For the first time in Olympic history, a refugee team of 10 athletes will participate in the games and will march behind the Olympic flag in the opening ceremonies before the host team Brazil. Another Syrian refugee, swimmer Ibrahim Al-Hussein, who lost part of his right leg to a bomb in Syria’s civil war, carried the Olympic torch through the Elaionas refugee camp in Athens last week. Unlike many other countries, the U.S. government doesn’t support American Olympians financially. Many turn to crowdfunding to support their year-round training and their trips to the Games.